Covering a wide spectrum of technical and musical concepts and offering a fresh perspective on the state of contemporary drumming, The Big Picture: Phrasing, Improvisation, Style & Technique (Hudson Music) is an exciting, new educational DVD by acclaimed drum artist Keith Carlock. The two-disc set features demonstrations, discussions and detailed dissections of the drummer’s spectacular timekeeping with a host of world-class musicians from mainstream pop icons Steely Dan, James Taylor and Sting to progressive fusion masters Oz Noy, Rudder and the Wayne Krantz Trio. During the course of the four-hour program, Keith displays the chops that have allowed him to take on these high-profile yet diverse playing situations—and top the Pop, Fusion, All-Around and Studio categories of the major drum magazines’ Readers Polls—while sharing the knowledge that will allow viewers to become better drummers and more complete musicians themselves. The Big Picture was filmed in front of a live studio/master class audience that elicited insightful, in-depth answers to questions on topics such as hand, foot and finger technique; grooving, fills and soloing; and phrasing, interpretation and improvisation. Additional Q&A segments cover the rich musical background and variety of influences that were instrumental in the development of Keith’s fluid, versatile, multi-dimensional drumming style. The project’s performance highlights include an open drum solo and playing to pre-recorded Oz Noy and Rudder tracks as well as an unprecedented four-song set and clinic with Wayne Krantz (guitar) and Tim Lefebvre (bass). 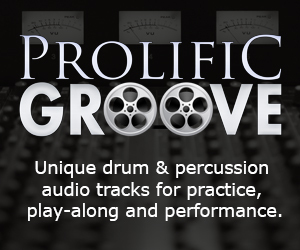 Available in DVD and instant download formats, the content also includes a viewable/printable, 29-page, eBook with transcriptions of many drum patterns and exercises plus an exclusive, easy to use, on-screen Video-PDF submenu; further enhancing its educational value. Other features include Hudson’s crystal-clear digital video, super-high fidelity PCM stereo audio and multiple camera angles. With its wide range of subject matter and comprehensive coverage, The Big Picture provides a thorough view of Carlock’s advanced approach to modern drumming as well as an overview of the fundamental skills that every drummer needs to play a full range of modern music. Keith Carlock - The Big Picture - Video Trailer!